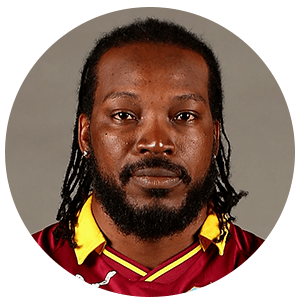 Christopher Henry Gayle, OD (born 21 September 1979) is a Jamaican cricketer and a former captain, who plays international cricket for the West Indies. Gayle captained the West Indies' Test side from 2007 to 2010. Considered one of the greatest batsmen in limited-overs cricket, Gayle has set and tumbled numerous records across all three formats of cricket. He is known as a hard big hitter, very often hitting sixes; in 2012 he became the first player to hit a six off the first ball of a Test match. He is one of only four players who have scored two triple centuries at Test level: 317 against South Africa in 2005, and 333 against Sri Lanka in 2010. Gayle became the first batsman in World Cup history to score a double century when he reached 200 off 138 balls against Zimbabwe during the 2015 World Cup. He finished on 215 runs, which was the record for highest score in a World Cup until it was broken by Martin Guptill against Gayle's own team. He is one of the five players to score a double century in ODIs. In March 2016, Gayle became only the second player (after Brendon McCullum) to hit two Twenty20 International hundreds, scoring 100 not out against England. He plays domestic cricket for Jamaica, and also represents the Royal Challengers Bangalore in the Indian Premier League, the Karachi Kings in the Pakistan Super League, the Melbourne Renegades in the Big Bash League and the Dhaka Gladiators in the Bangladesh Premier League. He has also represented Worcestershire, the Western Warriors, Sydney Thunder, Barisal Burners, Kolkata Knight Riders and Somerset in his career. He was also selected for team Uva Next for the inaugural Sri Lanka Premier League in 2012. Gayle started his cricket career with the famous Lucas Cricket Club in Kingston, Jamaica. Gayle claimed "If it was not for Lucas I don't know where I would be today. Maybe on the streets." Lucas Cricket Club's nursery has been named in honor of Gayle. Gayle played for the West Indies at youth international level prior to making his first-class debut aged 19 for Jamaica. He played his first One Day International eleven months later, and his first Test match six months after that. Gayle, who normally opens the innings when he plays for the West Indies, is a destructive batsman who is most effective playing square of the wicket. In July 2001, Gayle (175), together with Daren Ganga (89) established the record for opening partnerships at Queens Sports Club, Bulawayo when they put on 214 together against Zimbabwe. Gayle had a slow start to his international career, but invigorated it in 2002, ending the year with three centuries against India in November and becoming the third West Indian to score over 1,000 runs in a calendar year, along with Vivian Richards and Brian Lara. He is one of only six players in One Day International history to have three or more scores of 150. In 2005, Gayle was dropped for the first Test against South Africa along with six other players following a dispute over sponsorship issues (see below). He returned for the second Test but had a poor series until the fourth Test, where he made a match-saving 317. It was the first-ever triple century against South Africa and up until Mahela Jayawardene made 374, it was the highest individual Test score against them. In another match of the series, Gayle had to leave the field after complaining of dizziness. During a subsequent series against Australia, Gayle again complained of dizziness and shortness of breath during his innings. He left the field for a time, and was after the match sent to hospital where he was diagnosed with a congenital heart defect causing a cardiac dysrhythmia. He underwent heart surgery following the series to correct the defect. Gayle was only the fourth West Indian to carry his bat in a Test innings. In August 2005, Gayle joined Worcestershire for the rest of the English season, playing eight matches. He made two half-centuries in three first class matches and two half-centuries in five one-day matches, and won one Man of the Match award in the one-day National League. However, Worcestershire were relegated after Gayle made 1 in the final match against Lancashire. Gayle was named Player of the 2006 Champions Trophy, where the West Indies nearly defended the title they won in 2004, being defeated in the final by Australia. Gayle scored three centuries and totalled 474 runs, 150 more than any other batsman, and also took eight wickets in as many matches. Gayle, in keeping with the rest of the West Indies team, had a poor World Cup in 2007. He recorded a series of low scores; the one exception being a blistering 79 off 58 balls against England in the West Indies' final match. Gayle set the first record for the highest innings in a Twenty20 International, scoring 117 against South Africa in the first match of the 2007 World Twenty20. The innings was the first century in international Twenty20 cricket and made him the first batsman to score a century in each of international cricket's three formats. The record stood unmatched until 19 February 2012, when South Africa's Richard Levi scored 117n.o. against New Zealand; Cricinfo recognised Levi as having broken the record outright, because a not out innings is ranked above a dismissal. In the semi-final match of the 2009 World Twenty20 against Sri Lanka, he became the first international player to carry his bat through the entire innings in this format of the game as well. In April 2008, Gayle was auctioned by the franchise Kolkata Knight Riders of the Indian Premier League, but missed the opening games due to a Sri Lanka tour to the Caribbean. When he finally joined the team, he missed out on the action due to a groin injury he picked up during that tour. Afterwards, he left to join the West Indies team for a home series against Australia, therefore not playing in the inaugural version of the IPL. He played in the second IPL competition in early 2009, arriving for an away Test series against England very late, earning criticism about his commitment. His Test series went poorly, and the West Indies went on to lose both the Test and ODI series. Gayle, however, went to on score a match winning 88 in the first official match of the 2009 Twenty20, in a surprise victory over Australia. 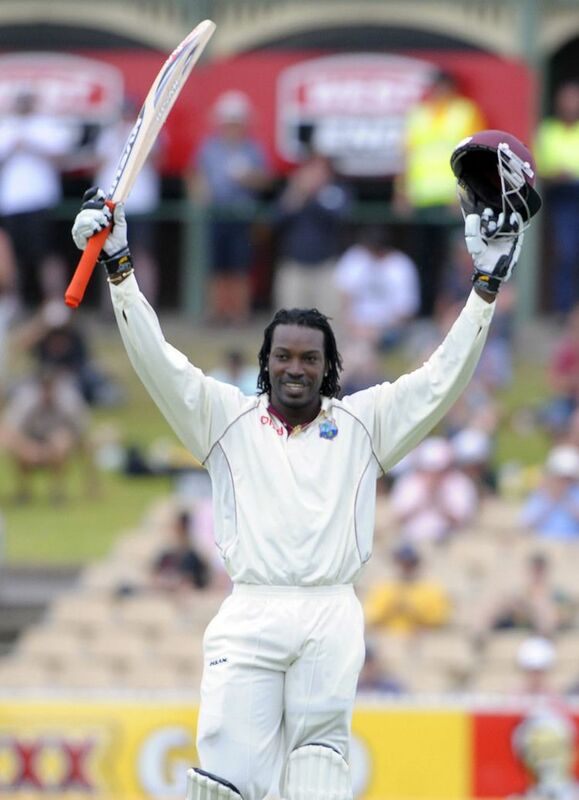 On 17 December 2009 in the Australia v West Indies 3rd Test Chris Gayle scored the fifth-fastest century in Test match history. He reached the century in just 70 balls. However he was shortly after dismissed for 102 runs. This feat included a flurry of runs thanks to some big hitting sixes. On 16 November 2010, he became the fourth cricketer to score two triple centuries in Test cricket after Donald Bradman, Brian Lara and Virender Sehwag. On his return to Test cricket in July 2012, he scored 150 on the third day of the first Test against New Zealand. Gayle scored 75 runs from 41 balls, fuelling West Indies' total of 205, against Australia in the 2012 ICC World Twenty20 semifinal, which was the highest total of the tournament. In November 2012, during the First Test against Bangladesh in Dhaka, Gayle became the first player to hit a six off the first ball in the history of Test cricket. In February 2015, he became the fourth cricketer to score a double century in ODIs when he made 215 against Zimbabwe. In this match against Zimbabwe in World Cup in Canberra, Gayle became the first player to hit a double century in World Cup history. His partnership with Marlon Samuels was the most productive wicket in Cricket World Cup history, producing 372 runs before Gayle was caught for an out on the final ball of the innings. Coincidentally, he was almost adjudged out on the very first ball he faced as an LBW appeal was raised by Zimbabwe bowler, Tinashe Panyangara, however, the umpire turned down the appeal. Despite a review which showed that the ball would have clipped the top of the bails, the original decision was upheld. Gayle thus became the only player in world cricket to hit a triple hundred in Tests, a double hundred in ODIs and a hundred in Twenty20 Internationals. On 1 July 2009, Gayle signed with the Western Australia Warriors for the Australian Domestic Twenty20 tournament known as the Big Bash for the 2009–10 season. In 2011, after being left out of the initial part of the West Indies T20 and one-day home series against Pakistan, Gayle opted to join the Royal Challengers Bangalore in the fourth edition of the Indian Premier League. In his debut game against his previous team Kolkata Knight Riders in their home ground, he scored 102 off 55 balls, hitting 10 fours and 7 sixes. On 6 May 2011, he scored another century, 107 off 49 balls in Bangalore against the Kings XI Punjab, which included 10 fours and 9 sixes. In the next match against Kochi Tuskers Kerala, he scored 37 runs in one over, which included 3 sixes, 3 fours and a no ball that was hit for a six. Although many people cite him as having hit the over for 37, one run was awarded as an extra due to the no ball. He can therefore be said to have hit 36 off an over that went for 37. Gayle won the Orange Cap Award for scoring the most runs in the tournament amassing 608 runs in 12 matches. He was instrumental in many victories for the Royal Challengers Bangalore and received five Man of the Match awards and also the Player of the Tournament award for his performances. In the 2011 Champions League Twenty20, Chris Gayle was the second highest run-scorer in the competition, behind David Warner, with 257 runs from 6 matches at an average of 42.83 and a top score of 92, and was one of the star players. Following his prolific performances Gayle was signed by Zimbabwean franchise Matabeleland Tuskers, for the 2011-12 Stanbic Bank 20 Series. As Gayle later recalled it was valuable practice ahead of the KFC Twenty20 Big Bash, where he had signed for the Sydney Thunder. Gayle hoped his first appearance in the tournament was a success, and he gave the spectators something to cheer about. Gayle was the second West Indian to be signed in the event, after the legendary Brian Lara had signed for Southern Rocks the previous season. Gayle enjoyed great success in that tournament. He was the leading run-scorer in that series with 293 runs, a top score of 109, and an average over 50, the best of the tournament. Ironically, the only century Gayle scored in the event ended in defeat as Mid West Rhinos's Brendan Taylor's outstanding 75* outlasted his team. The Tuskers could not win the tournament as they were overpowered by Mashonaland Eagles's Ryan ten Doeschate's brilliant 121* off 58 and despite Gayle scoring a half-century, it was not enough to see his home through. Gayle also joined the Barisal Burners in the Bangladesh Premier League, and has scored two centuries at more than a run-a-ball. In the 2012 IPL season, Gayle hit the most sixes (59) and was nominated for the orange cap for making 733 in 14 matches. He was selected for team Uva Next for the inaugural Sri Lanka Premier League in 2012. Gayle started off his 2013 IPL season scoring 92 not out from 58 balls, hitting 11 fours and four sixes against the Mumbai Indians. His innings helped his side to victory, and he was awarded the Man of the match. On 23 April 2013 during an IPL match against Pune Warriors India, Gayle broke multiple scoring records. With an individual score of 175 not out off 66 balls and a century reached in 30 balls, Gayle set records for the fastest century reached in any format of cricket, the highest individual score in a T20 match, and the most sixes scored in a single innings in the IPL. He also took two wickets in the match. On January 18, 2016, in a match with the Adelaide Strikers, Gayle set a new Big Bash League record for the fastest fifty and equaled the world record set by Indian batsman Yuvraj Singh against England in the 2007 ICC World Twenty20. He reached 51 in just 12 deliveries which included seven sixes and smashed the previous record of 18 deliveries set by Strikers batsman Tim Ludeman. He was dismissed shortly after for 56 off 17 balls by Travis Head. Chris Gayle was signed by Lahore Qalandars in 2016 for 200,000 dollars to play in the Pakistan Super League. 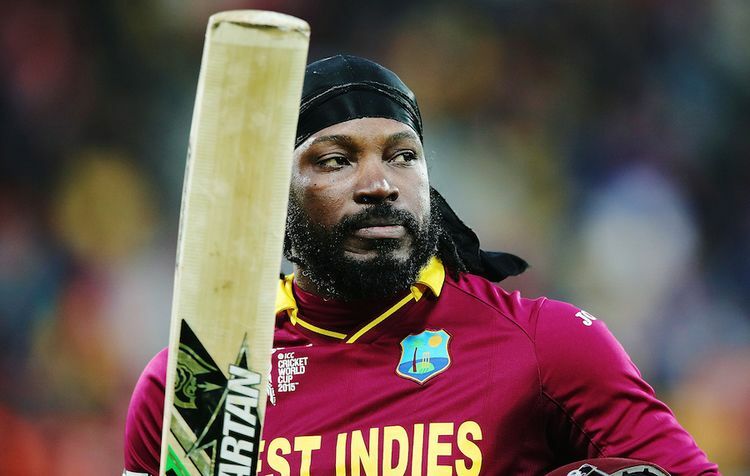 Gayle had his worst T20 league, citing back problems. He only scored 103 runs from five matches and was also out twice for a golden duck, the most in his T20 career, by Junaid Khan. On 18 April 2017, Gayle reached the 10,000 runs milestone in T20 cricket after scoring 77 runs of 38 balls in a match against Gujarat Lions where Royal Challengers Bangalore won by 21 runs. He was also awarded the man of the match which was his first in IPL 2017. Playing for Royal Challengers Bangalore, he scored a 30-ball century, that became the highest individual T20 score (175 not out). It eclipsed the previous mark set by Brendon McCullum of Kolkata Knight Riders. At the launch of the Caribbean Premier League he was announced as the first franchise player for the league. He has scored T20 centuries in India, Bangladesh, Zimbabwe, Australia, South Africa, West Indies and in England. He missed to hit centuries in CLT20, SLPL, PSL only. He only misses out to score T20I centuries in main nations such as Sri Lanka, Pakistan, UAE, New Zealand etc. 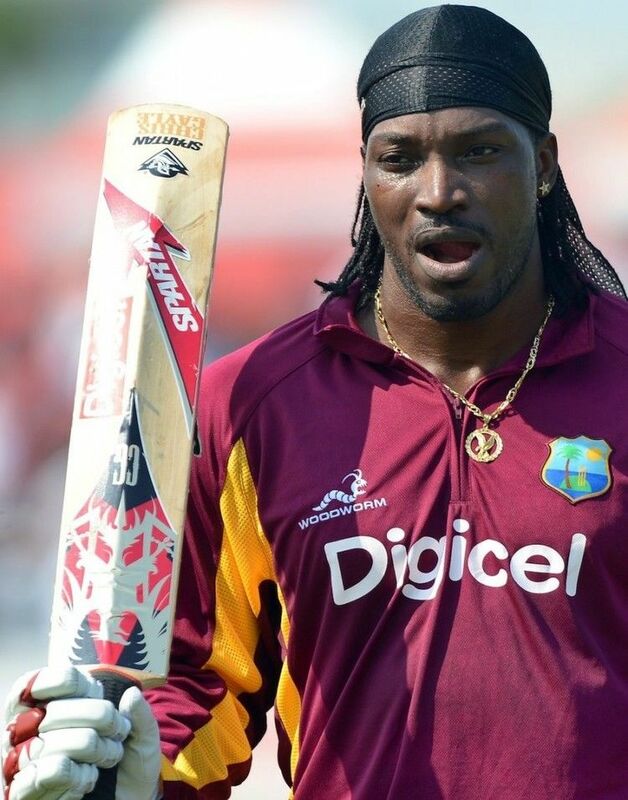 Gayle is known for his characteristic hitting, imposing physique, and timing. He attributes the latter to being very thin when young, and having a heavy bat. He is known for appearing very calm as the bowler approaches. "Tall and imposing at the crease, he loves to carve through the covers off either foot, and has the ability to decimate the figures of even the thriftiest of opening bowlers" recorded Wisden and CricInfo. He holds numerous records that reflect his batting style, including record Twenty20 strike-rates and high scores. "It is instinct... We premeditate at times, but most of those things are instinct. When a fast bowler runs in to me, my breathing is controlled. So you keep a still head, slow down your breathing. Sometimes I actually hold my breath, so I can be as still and well-balanced as possible. If you get too excited, you overreact more, and with the adrenalin, you lose focus quickly." 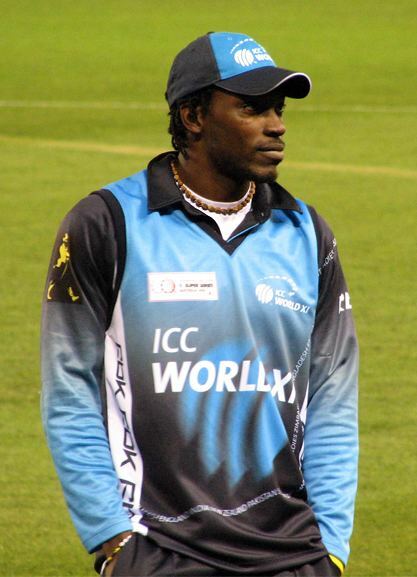 Despite being regarded as a calm, cool cricketer, in 2005 Gayle was involved in the dispute between the West Indies Cricket Board and a number of players over sponsorship issues. These players had personal sponsorship deals with Cable and Wireless, who used to sponsor West Indian cricket. However, since the West Indies had recently become sponsored by Cable and Wireless' rivals Digicel the West Indies Cricket Board demanded the players dropped their Cable and Wireless deals. When the players refused to back down, the West Indies Cricket Board dropped them for the first Test against South Africa. Gayle later cut his deal with Cable and Wireless and rejoined the side for the second Test. He was charged with conduct contrary to the spirit of cricket during a Test against New Zealand in March 2006, but was subsequently found not guilty. Later that year, during October's Champions Trophy tournament in India, he was fined 30 percent of his match fee after repeated verbal exchanges with the Australian batsman Michael Clarke. He also publicly criticised the West Indies Cricket Board during the 2007 tour of England, which led to an official reprimand and warning. Gayle also received criticism in early 2009 during West Indies' tour of England, where he commented that he did not want to captain the West Indies any more given the pressures involved, and that he "wouldn't be so sad" if Test cricket was superseded by Twenty20 cricket in the future. From the West Indies, both Viv Richards and Gary Sobers criticised Gayle's comments, as did opposite number Andrew Strauss. 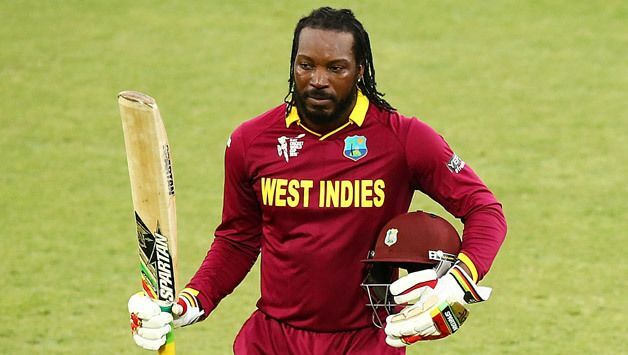 Gayle later commented that his statement had been quoted out of context, according to Julian Hunte, President of the West Indies Cricket Board. In an interview with Mike Atherton at the conclusion of a West Indies defeat in their tour of England, Gayle stated that he was not going to resign the captaincy. In April 2011 Chris Gayle criticised the West Indies Cricket Board and coach Ottis Gibson and did not play for the team for more than a year. On 6 April 2012, Gayle and the WICB reached an understanding that paved the way for the former West Indies captain to return to the national team. On 25 June 2012, Gayle was chosen to be a part of the 2 T20 and five- match one-day squad series starting on 30 June 2012, in the West Indies and Florida. They won the T20 series 2–0 in which Gayle was awarded man of the series, and the ODI series 4–1 in which Gayle made an aggressive century and half-century. On 4 January 2016, while being interviewed by Network Ten commentator Mel McLaughlin during the 2015–16 Big Bash League season, Gayle said "so hopefully we can win this game and we can have a drink after" followed by "Don't blush, baby". The comments were criticised by the Australian media, with former Australian test captain Ian Chappell encouraging Cricket Australia to ban him from playing in Australia again. Fellow female sports journalist Neroli Meadows stated that Gayle had been acting in such a way for years, and that he did it to "humiliate" women. Gayle said the comments were intended to be a joke. Melbourne Renegades sanctioned Gayle with a A$10,000 fine for inappropriate conduct. Gayle has scored 39 international centuries, which includes 15 Tests, 22 ODIs and 2 T20I centuries. He is the first cricketer to score centuries in all formats of the game excluding the Pakistan Super League whilst representing Karachi Kings and Lahore Qalandars . First batsman to score a century in each of international cricket's three formats of the game. First batsman to score a T20I century as well as a T20 World Cup century. He's also the only batsman to score two T20 World Cup tons. In fact, he holds the record for being the only batsman to score a T20I century in a losing cause as well as to score a T20I century in a winning cause. He too holds the record for being the only batsman to score a T20I century when batting first as well as when batting second. First international player to carry his bat through the entire innings in Twenty20 International. He is also the only player to Carry his bat in both tests and T20Is. First player to hit a six off the first ball in the history of Test cricket. 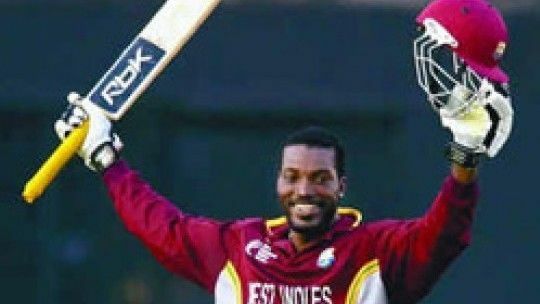 First player of West Indies to hit a double century in ODIs as well as in World Cup history. First batsman to score 10,000 Twenty20 runs in career. He was only the fifth player in ODI history and second from West Indies to score an ODI hundred in his 100th ODI. Only player in world cricket to hit a triple hundred in Tests, a double hundred in ODIs and a hundred in Twenty20 Internationals. He also holds a joint record along with Yuvraj Singh for hitting the fastest T20 half century in 12 balls. Gayle also holds the record for highest individual score in T20 which is 175* off just 66 balls against Pune Warriors India. Also holds the record for the highest individual score as an opener in Twenty20 cricket. Holds the record for the most runs scored by a player in a any forms of T20 in a losing cause (151*) and the only batsman to score 150 in a T20 innings in a losing cause.